The National Democratic Alliance at the Centre, led by Prime Minister Narendra Modi, may get a thin majority with 285 seats, only 13 seats more than the magic mark, in the Lok Sabha elections. 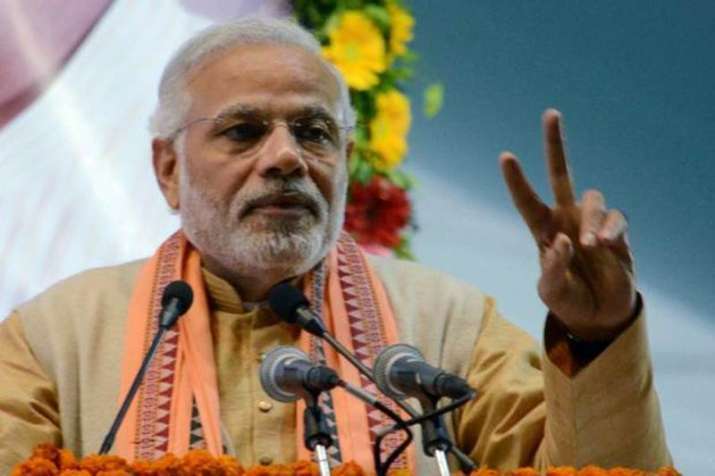 The National Democratic Alliance at the Centre, led by Prime Minister Narendra Modi, may get a thin majority with 285 seats, only 13 seats more than the magic mark, in the Lok Sabha elections, dates for which were announced by the Election Commission today. BJP's tally may fall from 282 to 238 seats, 34 short of the midway mark of 272 in the 543-seat Lok Sabha, says the India TV-CNX opinion poll telecast this evening on the news channel. Congress tally may jump from 44 in 2014 to 82 this time. The opinion poll was conducted between March 1 and 7 in 193 out of 543 parliamentary constituencies of India, among a total voter sample of 38,600 respondents. These included 20,455 males and 18,145 females. The opinion poll gives a projection of NDA win in 285 seats, followed by Congress-led UPA in 126 seats, and 'Others' including SP, BSP, TMC, TRS, regional parties and independents projected to win in 132 seats. In the NDA kitty totalling 285 seats, BJP may win 238 seats, Shiv Sena 10, JD(U) 12, Akali Dal 3, LJP 3, and other regional and smaller parties. In the UPA total of 126 seats, the Congress may win 82 seats, DMK 16, Lalu Yadav's RJD 8, TDP 3, and other regional and smaller parties. The crucial list of 'Others' is led by Mamata Banerjee's Trinamool Congress with 30 seats, Samajwadi Party 18, Mayawati's BSP 16, YSR Congress 22, Telangana Rashtra Samithi 14, Biju Janata Dal 14, AIADMK 12, Left Front 6, and other regional parties. The BJP, post-air strike, is projected to make a clean sweep of all LS seats in the states of Gujarat, Himachal Pradesh, Uttarakhand, Goa and Delhi. Uttar Pradesh: BJP 40, BSP 16, SP 18, Congress 4, RLD 1, Apna Dal 1, Total 80. Uttarakhand: BJP 5. Total 5. Rajasthan: BJP 20, Congress 5, Total 25. West Bengal: Trinamool Congress 30, BJP 12, Total 42. Odisha: Biju Janata Dal 14, BJP 7, Total 21. Chhattisgarh: BJP 6, Congress 5, Total 11. Punjab: Congress 9, Akali Dal 3, AAP 1, BJP 0, Total 13. Bihar: BJP 15, RJD 8, JD(U) 12, Congress 2, LJP 3, Total 40. Jharkhand: BJP 8, JMM 3, Congress 2, JVM(P) 1. Total 14. Gujarat : BJP 26, Congress 0. Total 26. Himachal Pradesh: BJP 4, Congress 0, Total 4. Maharashtra: BJP 22, Shiv Sena 10, Congress 9, NCP 7, Total 48. Goa: BJP 2, Congress 0, Total 2. Tamil Nadu: DMK 16, AIADMK 12, AMMK 2, Congress 5, BJP 1, PMK 2, Other-1.Total 39. Andhra Pradesh: YSR Congress 22, TDP 3, Congress 0, Total 25. Karnataka: BJP 13, Congress 13, JD(S) 2, Total 28. Kerala: UDF 12, LDF 7, BJP 1, Total 20. Jammu & Kashmir: BJP 2, NC 1, Congress 2, PDP 1, Total 6. Assam: BJP 8, AIUDF 2, Congress 4, Total 14. Other North East states: BJP 3, Congress 3, MNF 1, NPP 1, CPI(M) 1, NDPP 1, SDF 1. Total 11. Delhi: BJP 7, Congress 0, AAP 0. Total 7. The survey covered both residential and business areas, remote and key localities, including upper middle class colonies, and the sample respondents came from all walks of life, including cobblers, tailors, barbers, daily wage labourers, petty shopkeepers, mechanics, medical practitioners, auto-taxi drivers, real estate dealers, etc. The error margin has been kept at +/-2.5 per cent.